Wall Street's main markets fell on mixed earnings and cautious investor sentiment ahead of the French presidential election this weekend. With polls in France showing a tight contest ahead of Sunday's voting, "nobody wants to take any new position," said Karl Haeling, of LBBW. 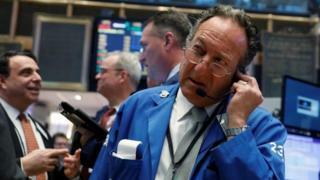 The Dow Jones fell 0.2% to 20,547.55, while the S&P 500 shed 0.3% to 2,348.7. The Nasdaq lost 0.1% at 5,910.52. General Electric fell 2.4% despite posting higher profits. A steady stream of strong earnings through the week had helped to buoy market sentiment. Of the 95 companies in the S&P 500 that reported earnings, about 75% topped expectations, according to Thomson Reuters data. That was above the 71% average for the past four quarters. Overall, profits of S&P 500 companies are estimated to have risen 11.2% in the quarter, the most since 2011.